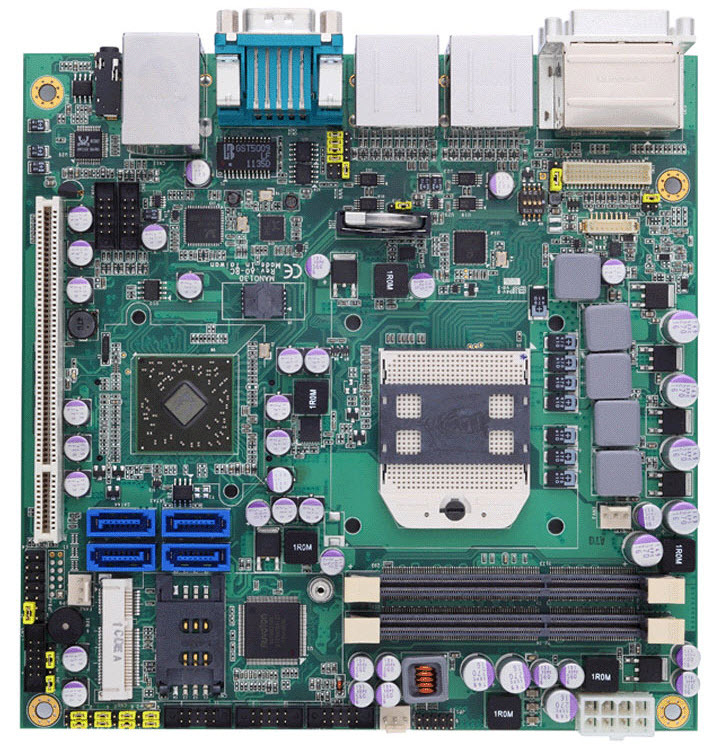 Axiomtek's MANO111 Mini ITX motherboard is designed to support the newest Quad Core / Dual Core AMD R-Series APUs with AMD A75 Controller Hub. 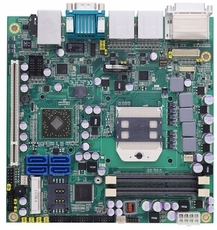 Integrated with Radeon HD7000 series graphics controller, this industrial-grade Mini ITX motherboard offers advanced 3D graphics and supports a total of three independent displays via dual DisplayPort and dual DVI-D connections on the rear I/O, as well as onboard 18-bit/24-bit dual channel LVDS interface; and quad-view via splitter connected to DisplayPort #2 which supports multi-stream. The platform comes with two DDR3 1333/1600 MHz SO-DIMM slots for up to 16 GB of system memory and four SATA ports with RAID 0, 1, 10, 5. The MANO111 also provides one PCI slot for standard I/O expansion, PCI Express Mini card with SIM card slot for WiFi and 3G wireless communication modules. For applications looking for more security protection, TPM 1.2 is also integrated into this board. The MANO111 is ideal for applications in retail, medical, gaming, digital signage and many more. Network Interface 1st port as 10/100/1000Mbps supports wake-on-LAN PXE with Realtek RTL8111E. 2nd port as 10/100/1000Mbps supports wake-on-LAN, PXE and DUSH with Realtek RTL8111DP. IO Interface 1 x RS-232/422/485 (COM 1); with +5V/+12V. 4 x RS-232 (COM 2~5); with+5V/+12V. 1st port as 10/100/1000Mbps supports wake-on-LAN PXE with Realtek RTL8111E.